A Deck is a canvas where you can create an interactive lesson to engage students. You may add Activities and Paths to encourage students' progression. Explore the Deck Gallery for decks made by other teachers. 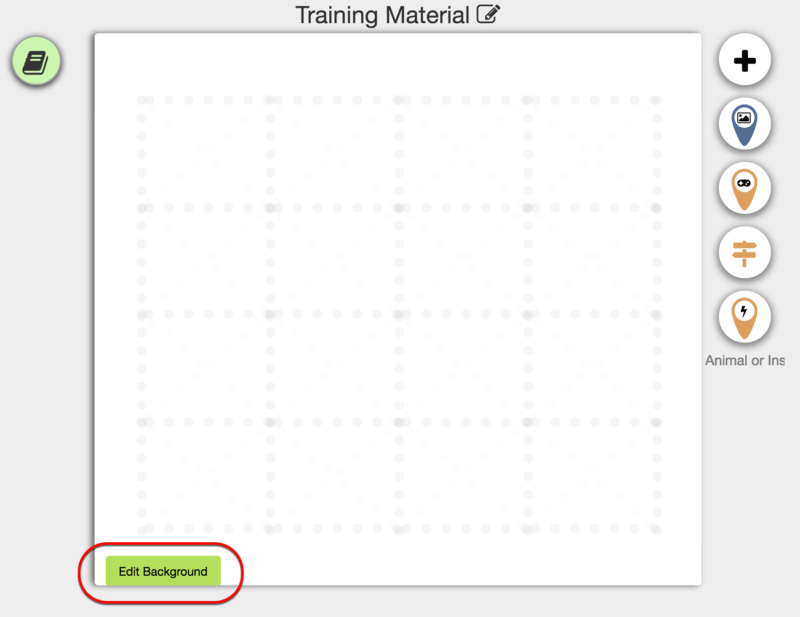 In the My Dashboard page, click on the + button under Decks to create your first lesson. Next, give a name to your deck; for example, Training Material. 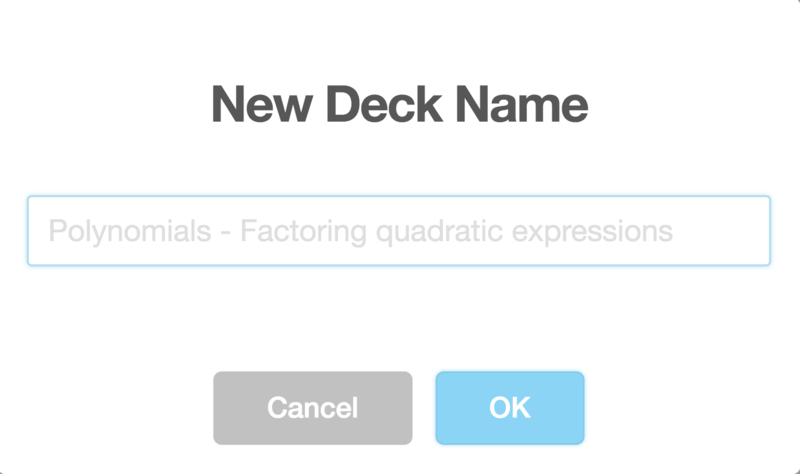 To add graphics to your deck, click on the 'Edit Background' button. Choose from the default graphics, or your image to be uploaded. Click the 'Save and Exit Background Editor' once you have completed. There are three different Activities which you may use; Slides, Study Set App, and Signpost. Study Set App serves as an activity for assessment where you may transform your dull assessment tool into fun challenges to complete. Currently, we have seventeen different apps which you may use in your lesson. Signpost is useful for a short introductory note to the lesson or the activities ahead. You may insert Activities using the drag-and-drop gesture. Paths are used to connect your Activities. After the student completes an Activity, the neighboring Activity will be activated, enabling the student to progress through the path. Adding divergent paths gives students the opportunity to self-explore on the challenges ahead. Read more about what Paths can do to enhance your student's learning. The Activity Lock is a powerful feature to increase engagement among students with the lesson. 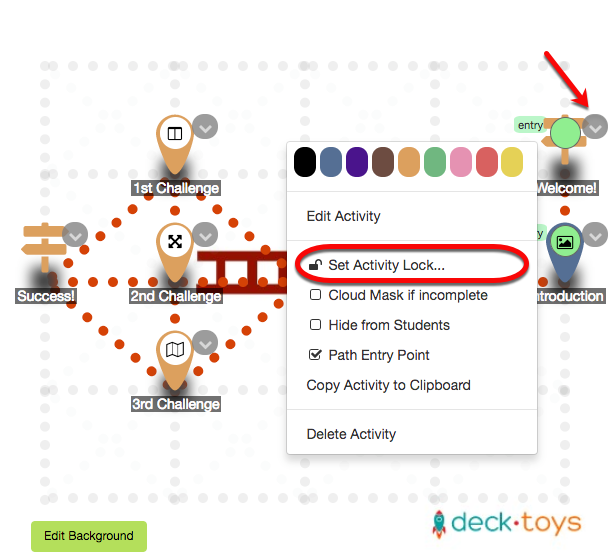 Just by adding a password lock to an Activity, students will be challenged to complete the Activity. To add a lock to your Activity, click on the drop-down icon and select ' Set Activity Lock...'. Read more here on how you can configure the lock for your Activity. 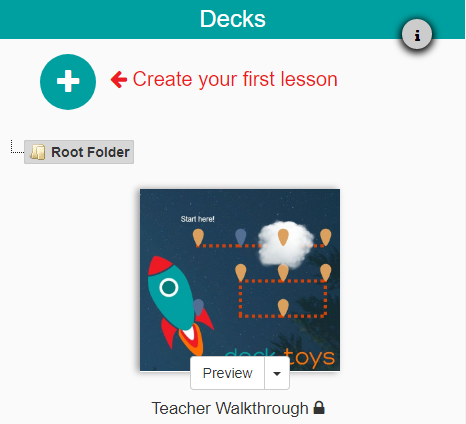 You may preview the current deck in the Test Classroom by clicking on ' Preview Deck'. The Test Classroom is a sandbox for you to test both the Teacher's and Student's views; Teacher’s view is on the left, and Student’s view is on the right. a) Off: Your deck is not accessible by anyone except you. You may still be able to assign this deck to your Deck.Toys Classroom for your students to access. Learn more about assigning deck to Classroom here. b) On - With Link: Your deck is only accessible by people whom you share the link to your deck with. c) On - Public: Your deck is accessible by everyone as it appears in the Deck Gallery. Read more about how you can share your deck here.